The importance of graphene can hardly be overstated. Graphene is the thinnest material comprised of atoms. It is only one atomic layer thick and hence an almost ideal representation of a two-dimensional material in our three-dimensional world. It has unique physical properties, including extreme mechanical strength and large electrical and thermal conductivity. Ever since the isolation of graphene with the "sticky-tape method" by Geim and Novoselov in 2004, for which they received the Nobel prize in 2010, research on graphene has increased dramatically. According to an article by Andrew Plume in the September 2014 issue of Research Trends (Issue 38, http://www.researchtrends.com), publications on graphene have increased almost exponentially from about 100 in 2004 to almost 10,000 in 2013. During the past decade, graphene has also paved the way for the exploration of other two-dimensional materials such as the transition-metal dichalcogenides. Optical Properties of Graphene, a book solely devoted to the optical properties of graphene, reviews the unique properties of graphene that hold great promise to revolutionize many photonic and opto-electronic devices. 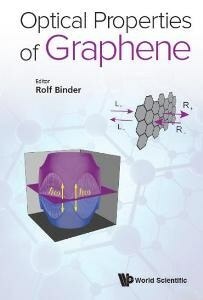 Comprising thirteen chapters written by world-renowned researchers in this field, the book covers a wide range of optical aspects of graphene, ranging from fundamental quantum mechanical properties to opto-electronic device applications of graphene. The chapters cover linear and nonlinear spectroscopy and optical response, including ultrafast pump-and-probe spectroscopy, terahertz spectroscopy, Raman spectroscopy, ultraviolet spectroscopy, with some chapters focusing on experiments and others on theory. They also cover examples of applications such as saturable absorbers, optical modulators and transparent electrodes. For readers less familiar with graphene, an introductory tutorial has also been included in the book. The tutorial presents basic physical concepts of graphene at a graduate-student level. In particular, it covers the electronic bandstructure, optical matrix elements, interband polarization, and the absorption spectrum of graphene. This book is sold at major bookstores at US$160 / £133 (hardcover). To know more about the book, or to place and order, visit http://www.worldscientific.com/worldscibooks/10.1142/10255.